It seems to me that an oxidized form of aluminum wouldn't be hard enough to use as an abrasive for sanding steel--that it would be weaker than aluminum, like oxidized steel is weaker than steel, so I suspect then that what is used as the abrasive on emery cloth is different from how it sounds. Also, sand, when melted, forms glass--an electrical insulator. This could cause a problem if sandpaper were used to polish metal, and sand fragments imbedded in the metal, then it was heated, and the resulting glass insulated the metal electrically---as in an HVAC guy cleaning a flame rod in a residential furnace, with sandpaper, to get a better electrical connection to the flame. He could inadvertently shorten the effective life of the flame rod. Aluminum is not an insulator, so my assumption is that given the same scenario except aluminum oxide abrasive cloth is used, that would not end up also insulating the flame rod. I was told once that it could, but I don't believe that for the above reasons, but I thought I should ask the question to see what you all think. Note that if you have ever seen someone take an Al can to scrape ice off their windshield and see them scratch it you might not sal Aluminum Oxide is too soft. diamonds are hard, guess what they are made of? dont know the hardness of Buckminster fullerine, a newer stable form of carbon. a jet of water can cut thick steel and just about anything else and ice in the form of glaciers can wear down mountains. what is the hardness of woodpecker lips? anyone? anyone? Anodized aluminum won't conduct electricity, so I am thinking that aluminum oxide grains wouldn't be either. Aluminum oxide is the reason you can't cut aluminum with a torch. The torched area creates aluminum oxide which in turn has a higher melting point than the flame on a cutting torch can achieve. Rubys and saphires are aluminum oxide with some trace elements added. It is harder than quartz. Forgive me if I'm being slow, but what I'm gathering here is that oxidized metals, (at least Al, and Fe) are harder than the metal is originally---then rusty steel must get weaker due to brittleness of the harder oxidized form? If Al oxide melts at a higher temp than a cutting torch can achieve, and an Al can will scratch a windshield because of its harder Al oxide form, then why will it melt in a campfire that won't melt steel? If a cutting torch can't melt Al oxide, then the blue flame of a furnace burner surely won't either. An aluminum drink camp will melt in a campfire because of how thin it is. I think if you had some steel that thin it would more easily melt too. I have melted/burned nails in fires while cleaning up construction debris so I don't thinks it's that hard to achieve. So... anyhow, BOTH iron oxide and aluminum oxide are more abrasive... harder... than the parent metals. Significantly so! I have seen sand melted into ingots of glass by downed power lines! I used to keep some around for show and tell... from my days as a firefighter! Sorry guys! I just gotta stir the pot a little! That one oxide of a metal (There are three different Iron oxides with various amounts of oxygen in them) is harder than the metal does not mean that another oxide is harder than the corrsponding metal. All elements do not behave in the same way. Aluminium has a lower melting point than Iron Thus the can melts but Iron turns into oxide. 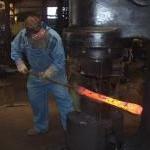 A cutting torch does not cut by meltiing but by burning the steel with the pure oxygen stream (the initial melt is to heat the steel enough to start the burning). The Iron oxides have lower melting point than Iron (thus it is possible to forge weld without flux) and will be blown away. The Aluminium oxide has higher melting point than the aluminium. Aluminium is highly reactive and there is always a very thin layer of oxide. This layer is so thin that it is invisible but so tight that it stops further reaction. This is what happens to stainless steel as well. Aluminium is used as a replacement to copper in electric wires so the thin layer obviously does not prevent electricity from flowing. As someone pointed out, the crystal form (if any) influences the properties so there can be different properties even if the chemical composition is the same. To be fair, without extreme temps, the oxides in the can don't typically melt, so much as the can loses mechanical cohesion as the underlayer melts. You get something similar when you melt zinc pennies with a copper coating. The oxides, if you're lucky float. They often don't...and then have to be scraped off the bottom of the crucible when melting. One of about ten thousand reasons that soda cans make a lousy melt. Doubts aside, aluminum oxide is frequently used in sand blasting and on sandpaper. I couldn't say about flame rods, but I've used sandpaper on plenty of occasions to clean corroded electrical connections. Works a treat. Theory isn't always what it's cracked up to be. Ever hear the one about the scientist that put an engineer and a mathematician in a room with a pretty girl? Told them they could cross half the distance every thirty seconds. The mathematician starts to storm out, furious. "It can't be done!" The engineer stays put, and the mathematician looks at him and says, "You fool, don't you see you can never reach her?" Engineer - "Yes, but I'll be close enough for practical purposes..."
Oh yeah, and an article on woodpecker beaks. Mohs hardness shouldn't be too hard to calculate from keratin and hard bone. *No* rusty iron is not weaker due to the brittleness of iron oxide. The iron oxide is present in a aggregation of small particles think of the difference between sand and quartz crystals, same material but one can be easily "cut". The weakness of rusty iron is due to loss of cross sectional area due to the rusting and the production of stress concentrators due to pitting due to rusting. As mentioned the aluminium oxide layer does not melt when you melt Aluminium it forms a part of the dross. Similarly when you forge rusty steel you don't forge the rust, it comes off in the fire and on the anvil and you forge the steel.